Stock # A345, ELECTRIC, Continuously Variable Transmission, 10098 mi. CarFax CERTIFIED Clean Title on this fun to drive level 2 charging capable 2016 GRAY Fiat 500e EV! 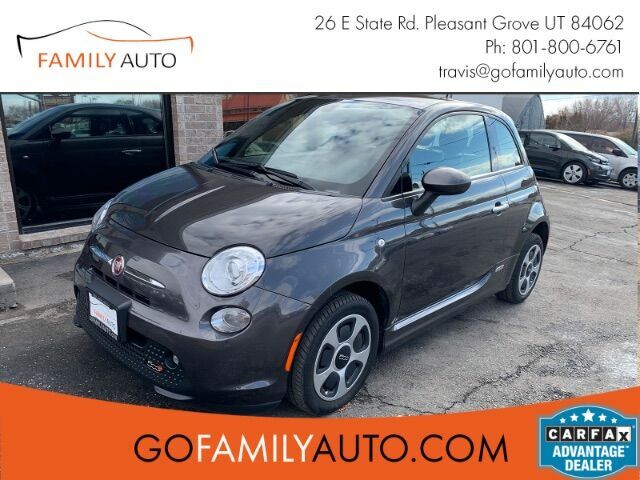 WE ARE UTAH''S TOP PRE-OWNED FIAT 500e DEALER! This Fiat is loaded with tons of great features including; Navigation, Leather, Keyless Entry, Sirius XM, Heated Seats, Power Windows/Locks/Mirrors and so MUCH more. www.GoFamilyAuto.com 801-800-6761. This car has passed all prepurchase inspections and is a NON-SMOKER. We are affiliated with most lenders and have rates as low as 3.99% OAC. YES!!! You get the balance of manufacturer warranties. Extended warranties are available. Family Auto strives to provide accurate vehicle information, from time to time we may miss a feature or include one erroneously. Please don''''t hesitate to confirm a specific feature.